Anyway, I've been wanting to share this recipe for the longest time! 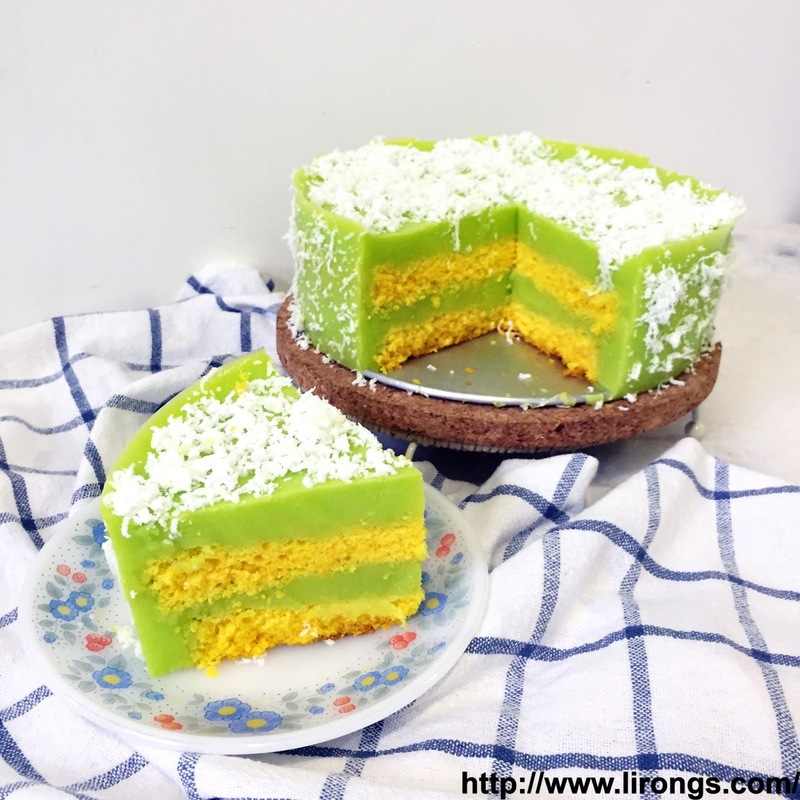 Pandan Layer Cake - not something new, if you do a simple Google, you'll probably find lots of them on the internet. 1. Beat the eggs with a hand mixer. Add in the sugar in 3 different batches and whip until the egg batter is light and creamy. 2. Add in the oil followed by vanilla extract. 3. Fold in the sieved flour until well combined. 4. Pour the batter into a lined 8" round tin. 5. Bake in preheated oven at 180 C for 25 mins. 6. Let the cake cool on a rack before removing from the pan. Slice into 3 equal slices horizontally when cooled. 1. In a pot, bring the pandan juice, butter and sugar to a boil. 2. 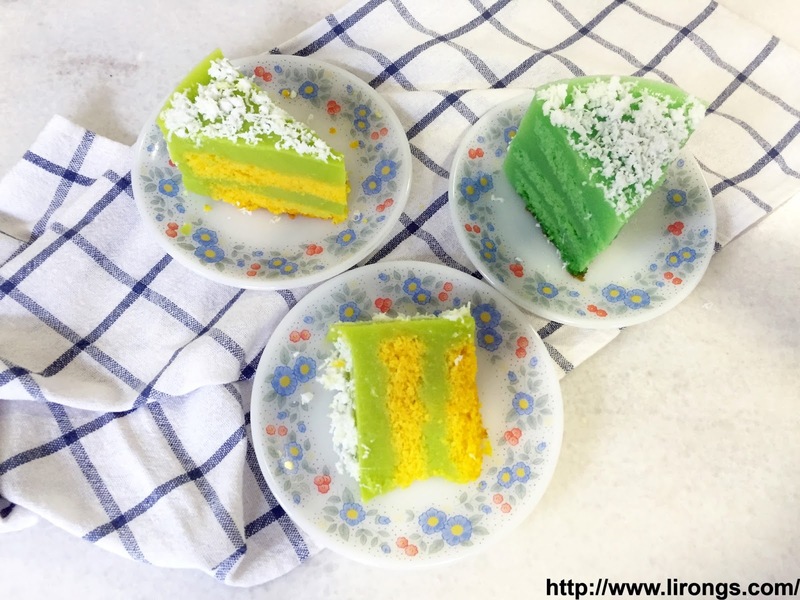 Combine coconut milk, water, hoen kwe flour, instant jelly powder, salt and pandan paste together. 3. Add (2) into (1), stir and cook till mixture thickens. 4. 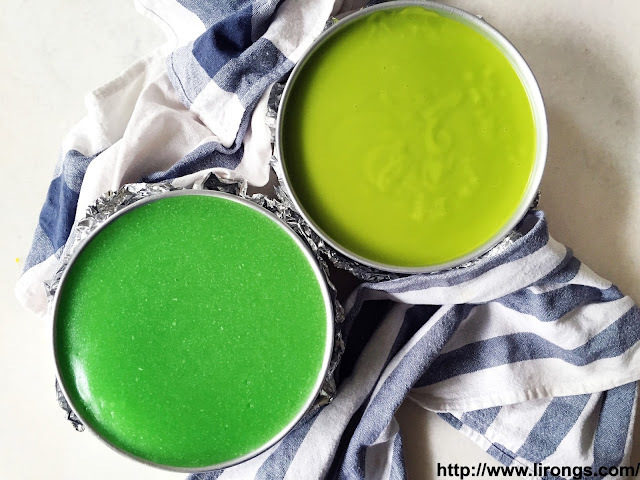 Remove from heat and let the mixture cool slightly before pouring onto sponge. 1. Place one layer of cake into a 9” cake ring. 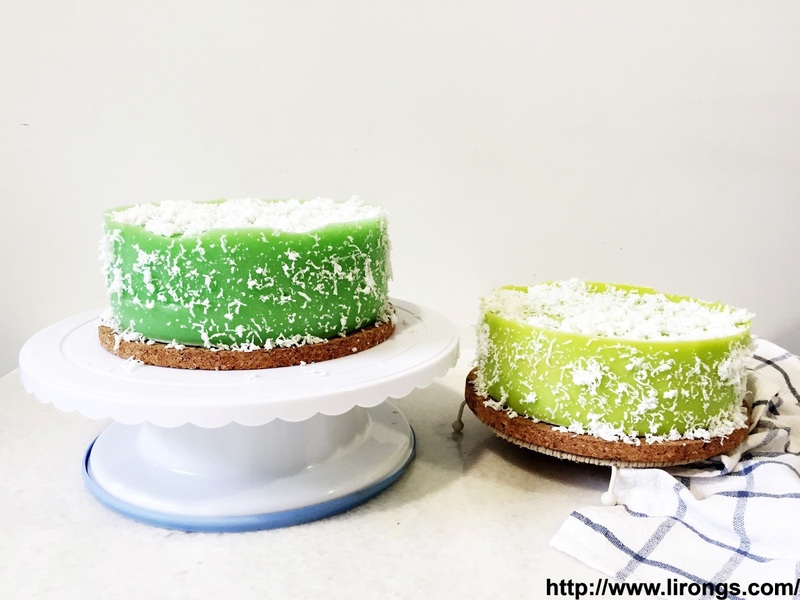 Pour some pandan pudding over, smooth it and top with another layer of cake. 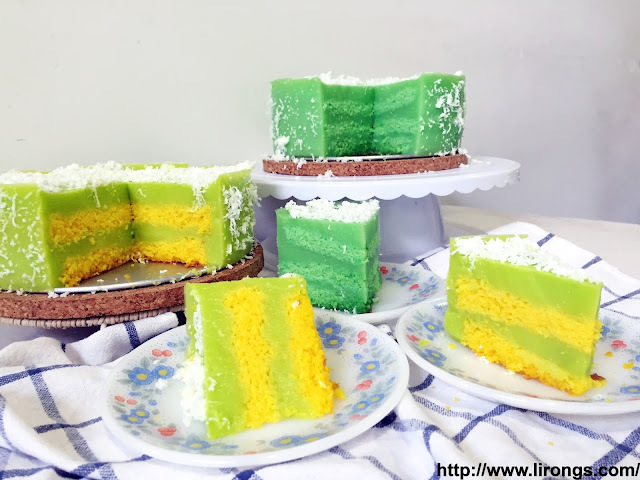 Repeat this step and finish the last layer with pandan pudding. 3. 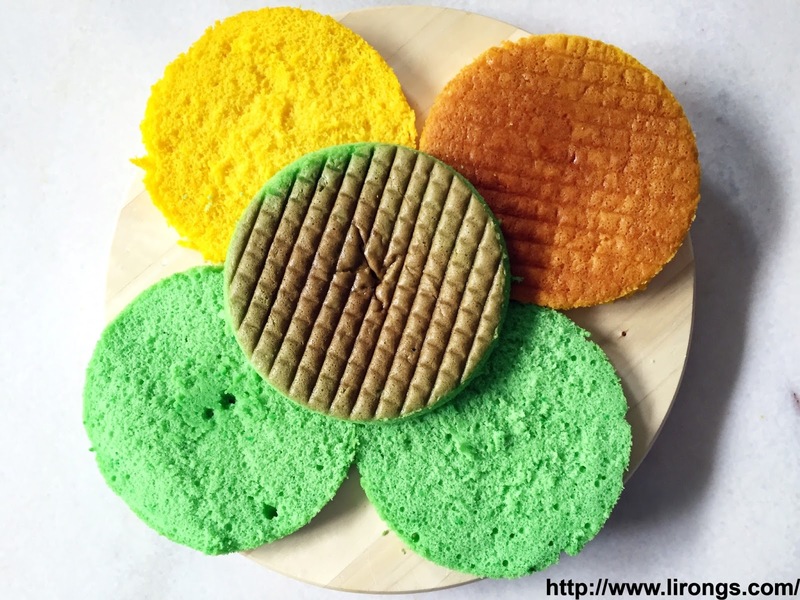 Remove the cake ring and decorate with desiccated coconut as desired. Hello.. how do u get pandan juice? Self made? Thanks in advance! Honestly speaking i have never seen a colorful cake like this before. It looks easy and i will try this. Because essay writing in canada is there to help me.